Haven't posted much or done anything in the way of experimentation / modifications over the last year or two due to changed work commitments. We had one person retire and another one leave for family reasons, and the changing nature of work to shorter term contracts meant we were not willing to replace them with people that we couldn't guarantee a long term position. Because of this I went from office / admin to more hands on work here. After 18 months it's starting to slow down a bit, giving me time to play. There are two main types of requests we've been getting over the last year and a bit, so we tackled these first, hopefully with one solution to suit both cases. The first was curing the bad drifting issue that the "ten meter export" type radios all suffer from to some degree. The second was converting some older non-PLL 23 channel radios to cover at least the standard 40 channels. Whatever we came up with would ideally do both jobs using the same hardware. The latter also had a couple of "would be nice if it could do this" requests. 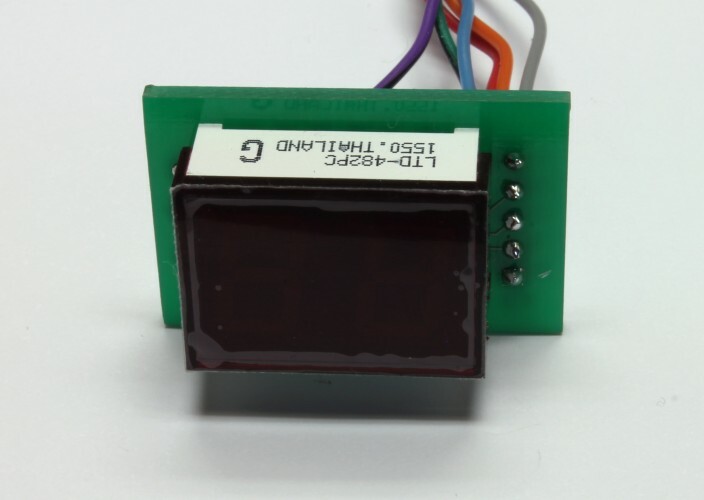 The first was a traditional 2 digit LED display to replace dial readouts, and the second was PC control so a standalone radio would be stock 40 channels, but expanded mode when controlled by a laptop PC, with things like continuous tuning, scanning, and a spectrum display. That will come later. For now, we just allowed for these features in the design. The circuit and changes had to use conventional / accepted electronic theory, using parts currently available new from well known suppliers. So no ground off IC numbers, changing electrolytics for tantalums for more smoother rounded super sliding, whack attacks, NBC1C, pink wire on bottom, or similar nonsense. First up, the Galaxy / Ranger drift issue. A completely drift free radio is impossible, even if it's only some tiny fraction of a hertz. So the goal is actually "drift reduction", not elimination. To work out how much is acceptable, we used our best Agilent signal generator, modulated with various speech audio, and had 3 people listen to it on a Barrett 2050 SSB receiver. The Agilent is locked to a 10MHz rubidium standard, good for 1Hz steps, and the Barrett is TCXO stable to within 1Hz at the test frequency. By switching between two frequencies without telling the listeners, we found that 15Hz was just detectable by one person and the other two managed 25. My ears were somewhere in the middle, close to 20 Hz. We had previously measured the temperature inside a car while working on something else a few years back. Coldest was 0 degrees C overnight in Tasmania, hottest was over 50 degrees C here in Sydney during summer. Loz donated a radio to the cause. Virgin late model Superstar 3900, and drifted by nearly 1KHz after being set perfectly a week before. PCB says it's a Ranger. Perfect candidate for this conversion / improvement. First, know the enemy. Find out why these things drift so badly and which components are the culprits. The 10.240 MHz oscillator. Generates the 10KHz channel steps, so if its too high the higher channels will be too high and the lower channels too low. The reverse applies if it's too low. In the donor radio it was low but varied only marginally with temperature. The components in red affect the frequency. By reducing the 30pF capacitor to 27pF we could set it spot on, measured at the 5.12Mhz output pin of the PLL so we wouldn't load down the oscillator. It varied by only a few Hz between cold and hot, so we left this part of the circuit as-is for now at least. 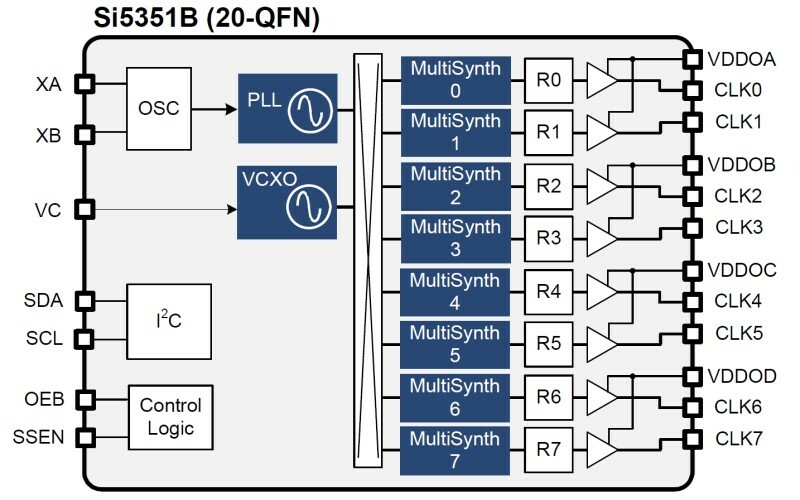 Next is the carrier insertion oscillator (CIO). This needs to operate on two or three different frequencies (the 3900 we had uses three) depending on the operating mode. For AM transmission, it operates at 10.695 MHz, which passes through the crystal filter and mixes with the 16 MHz local oscillator to produce the 27MHz transmit signal which is then high level modulated. It must be disabled for AM reception, otherwise it would swamp any incoming signals passing through the first IF stage. For SSB, it has to be at the edge of the IF filter passband in both Rx and Tx to pass one sideband and reject the other. By putting the signal at the low or high end of the passband, the desired sideband can be selected. For our 3900, the oscillator needs to run at 10.6925 MHz for upper sideband operation and 10.6975 MHz for lower. 3 tunable inductors and capacitors connected from one side of each inductor to ground are used to set the frequency. Those components, plus the crystal and the two phase shifting capacitors in the oscillator are all temperature sensitive (the components shown in red below). How much by? By using a hot air pencil set to minimum and a can of Freon spray we were able to shift the RF frequency by just over 1KHz by heating and cooling those parts. Last is the downmix oscillator. This mixes with the VCO / local oscillator (LO) to generate the downmix signal sent to the PLL. No division or multiplication occurs in this stage, so the relationship between the two is 1:1. 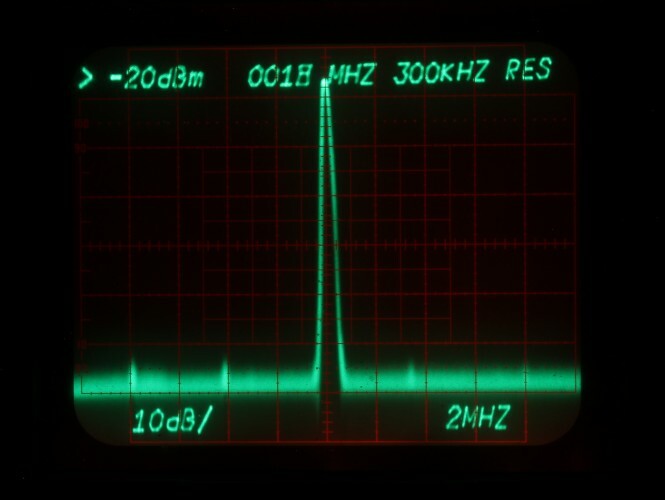 In other words, if this oscillator is out by 1KHz then the local oscillator will be out be this amount too. For the "mid" band channel 40 (27.405 MHz), the PLL divides by 270. The IF is 10.695, so the local oscillator frequency must be 16.71 MHz (27.405 - 10.695). 10 KHz x 270 = 2.7 MHz, so a downmix oscillator at 14.010 MHz is needed (16.71 - 2.70 MHz). 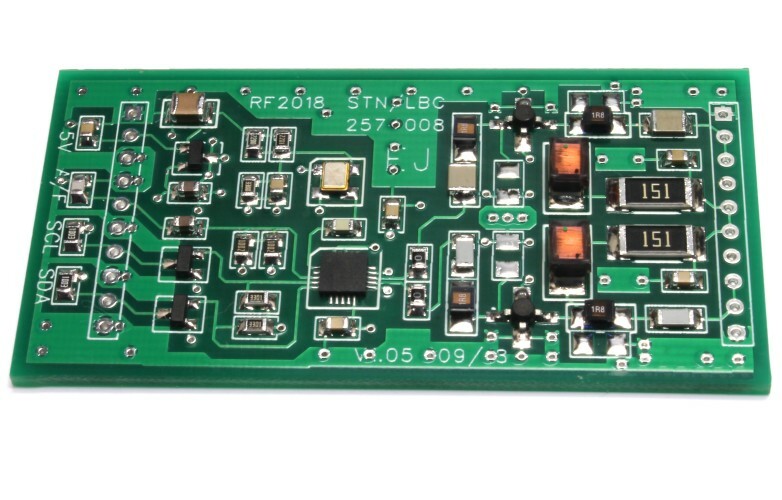 For SSB, the frequency has to be offset by half the bandwidth of the filter used to remove the unwanted sideband to cancel out the shift in the carrier oscillator. It therefore has to be shifted down by 2.5KHz for lower sideband and shifted up by 2.5KHz for upper sideband. This keeps the CIO + LO = transmitted frequency math correct. 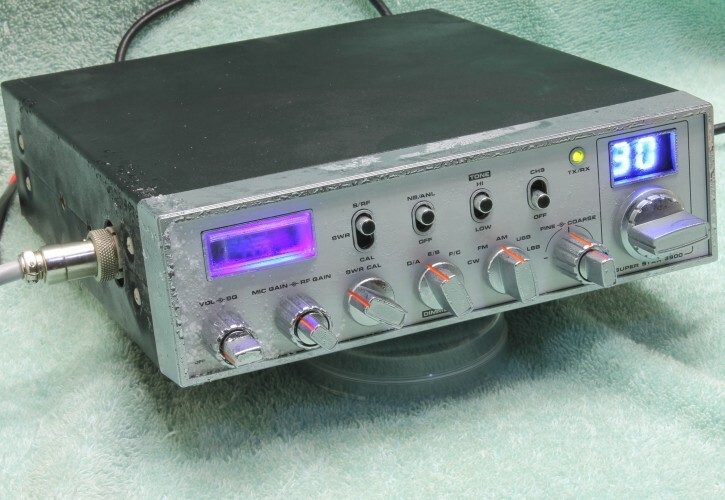 The clarifier is also wired to vary the downmix oscillator up and down by a few KHz, using a varactor diode to change the capacitance across the crystal. Too much capacitance can stop the oscillator, so where lots of range is needed (such as our 3900 with dual clarifiers) an inductance is added to the ground side of the varactor. This increases the range of the clarifier frequency change at the expense of thermal stability. So how to make it stable? Two possibilities, either don't change the temperature, or make a better pair of oscillators. The first option was not practical. If would waste several tens of watts of electrical power, and would have needed an hour or so at turn on for everything to stabilize. Improving the existing oscillators is similarly not practical. 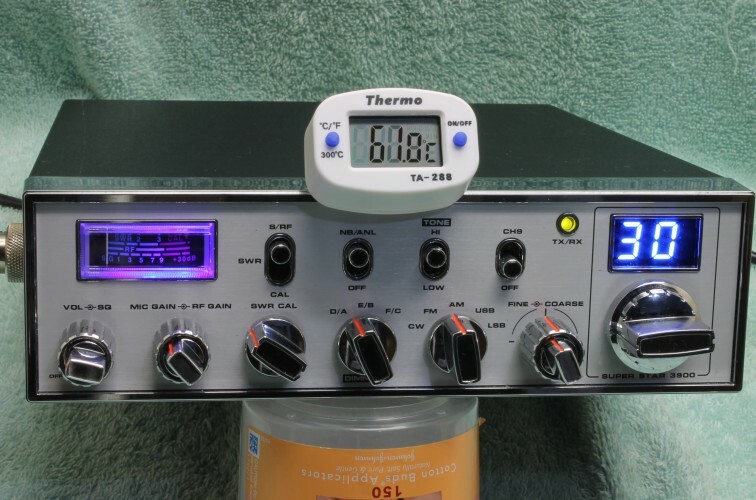 By carefully selecting capacitors of different temperature coefficients, or adding extra ones (such as across the crystal or varactor) you might improve one radio, but it's just as likely to make the next one worse. So decision was made, they have to go. Just need to work out with what. Searching around Digikey and Mouser, found a possible candidate. Made be adafruit, a tiny board, not much bigger than a postage stamp, that can generate any 3 frequencies from 8KHz to 160 MHz. That's quite a range, but the question remained is it good enough for radio work? We needed 16K to 32K of microcontroller, a 5V regulator, and a USB interface for connecting to a PC later down the track. 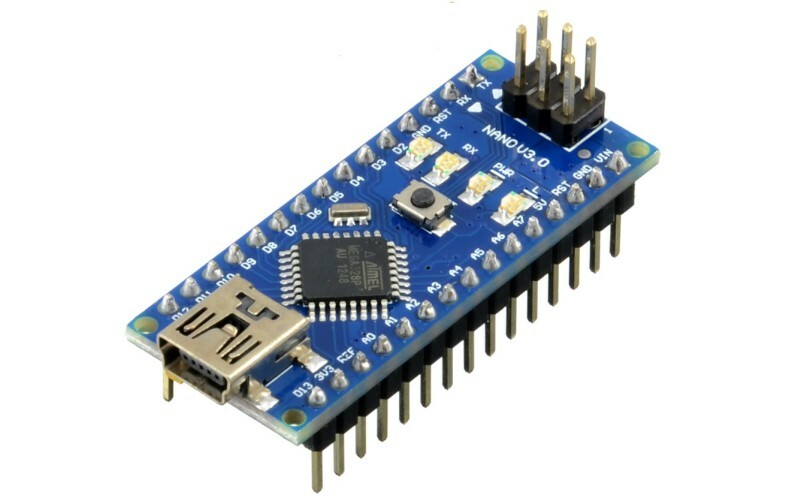 The Arduino Nano clones have all that in a ready to use board that costs under $5 shipped. Ordered a few of each to have a play, hooked it up to a temporary Arduino controller unit, downloaded a sketch (control program) from https://github.com/etherkit/Si5351Arduino, and took some measurements. It certainly worked as advertised, but it was too dirty (1V square wave output and way above 50 ohms impedance) and not stable enough (50ppm) for SSB. PPM for radio work is easier read as "hertz per megahertz", so 27 (MHz) times 50 (ppm) = stable to within 1350Hz. Thats more than the range of a clarifier on a regular 40 channel FCC SSB set, and 135 times too much for our target. The other issues were no analog control (for modulating FM and wiring up a clarifer without going through a microcontroller) in addition to the square wave output and the 1K ohm plus output impedance. There are three versions, A, B, and C. Adafruit use the A and a standard crystal, which is good enough for nearly digital / micro control uses. The B version has analog control at up to 10KHz rate (fine for voice FM mode later) and the C has more flexible input options (not much use for radio work). So ordered some "B" versions, a few TCXO modules rated at 1 and 0.28 ppm, and some RF amplifier / buffer ICs that should give us a nice 50 ohm output. By putting a tuned filter either / both between the synth > buffer and buffer > output, we hoped to generate a nice clean 50 ohm output at a few volts and stable to 0.5ppm. It was a real challenge wiring these up on perf board, and the results not promising. Messy on the display and instant wipe-out of a nearby radio tuned to the local easy listening FM station. Even looking at it closely changed the junk it was transmitting. Two things came out of that experiment - the filter was needed on both the input and output of the buffer, and it needed a proper circuit board with good grounding. Still had spurs on the output, coming from the USB port and the micro clock. 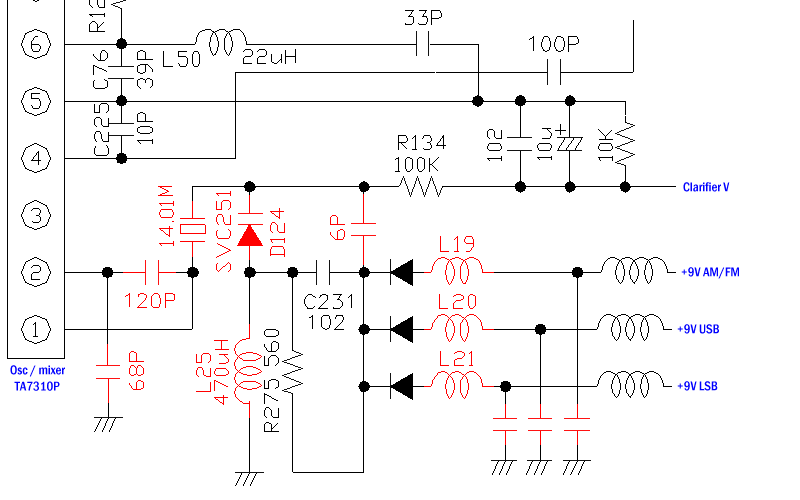 Needed to separate the noisy control circuit from the analog / RF side. 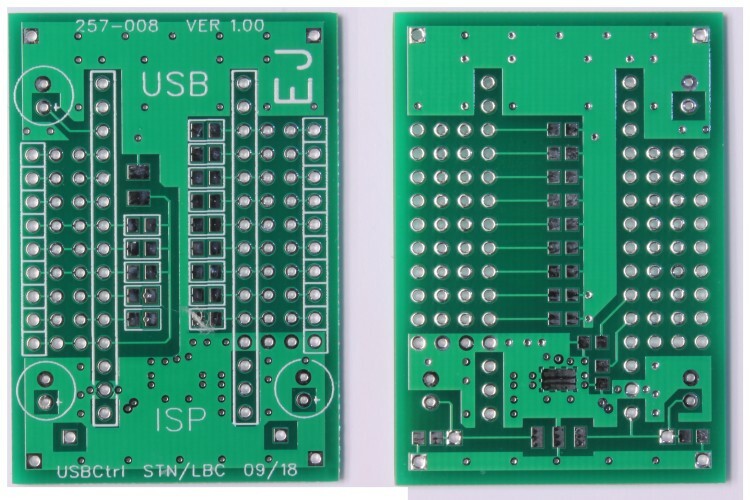 Another PCB redesign, either using shielded sections / canned areas, or by using separate boards for control and analog. Went the separate boards way, it made them small for easier fitting and quicker (no metal shielding needed) to assemble. Third time lucky? Had the redesigned boards made, then loaded and measured. Success! The third version puts the control, synth, and display onto separate boards to keep things small and reduce the noise. There are not many wires to connect - all communication is serial, so only 4 or 5 wires (+5V, ground, and 2 or 3 data wires) are needed to interconnect between them. The control board has SPI and I2C serial buses, 9 parallel inputs, 2 analog inputs, and a 9 volt 500mA low dropout regulator. The regulator has 3 purposes - it supplies the NANO (which has a maximum 12V supply rating, we need at least 15V for radio work), the clarifier, and the bias voltage for the synth buffers. 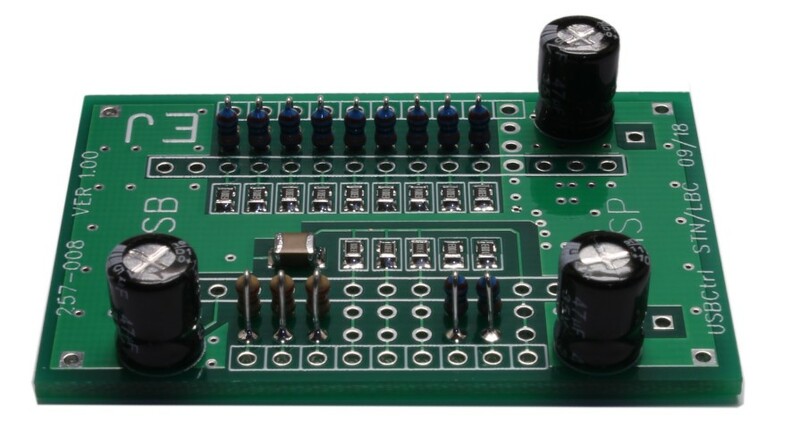 The inputs are isolated so they are tolerant of voltages above 5V, and bypassed with a 30Hz low pass filter to keep thing smooth and stop noise. 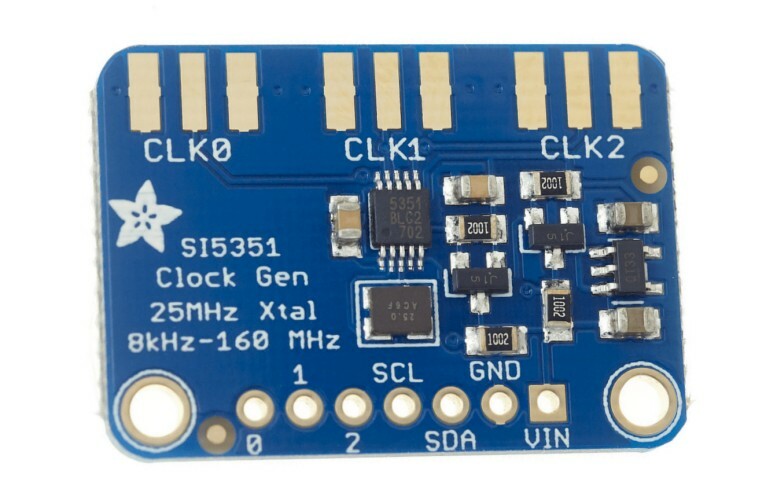 This uses a TI serial to 16 segment driver IC. It has a constant current source in it (so only one resistor is required, not 14) and is not multiplexed (so no display buzz noise). Board is designed so it can be fitted flat over an existing display board in most Uniden / Cybernet radios (after removing the old resistors!) to give a 99 readout from the existing channel LED. 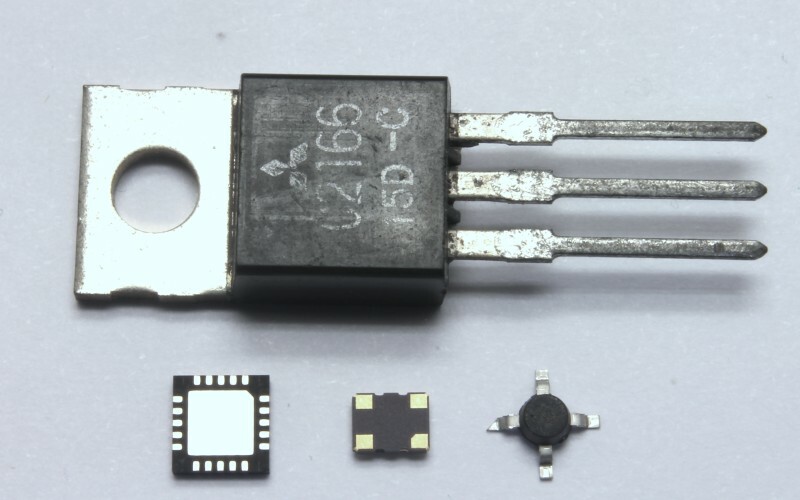 Because the NANO operates at 5V and the synth chip is a 3.3 volt device, a supply regulator and two level shifters are needed for the supply and communication lines. These are the 3 x SOT (black 3 legged devices) in the left and their associated resistors and capacitors nearby. 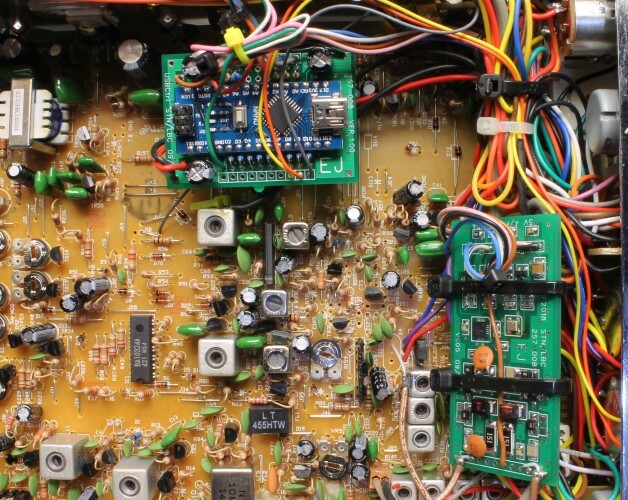 The gold colored device top-centre is the 0.28 PPM oscillator (Digi-Key Part Number 1664-1209-ND). This generates a precise 25 MHz square wave +/- 6Hz or so, stable from -40°C to 85°C. 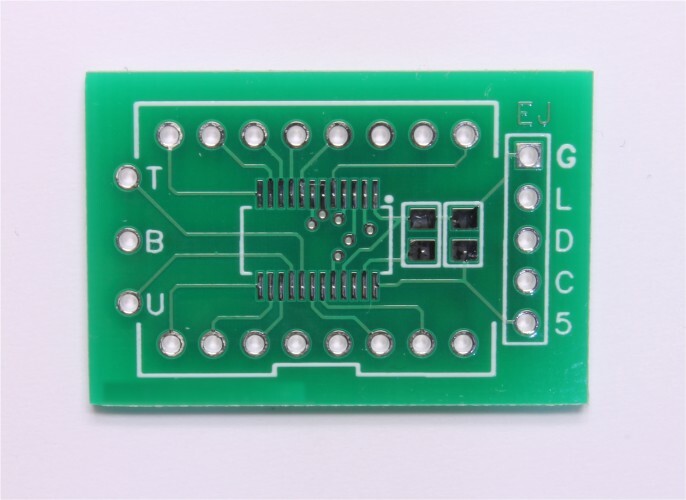 Below that us the Silabs synth chip (26 pad QFN package). 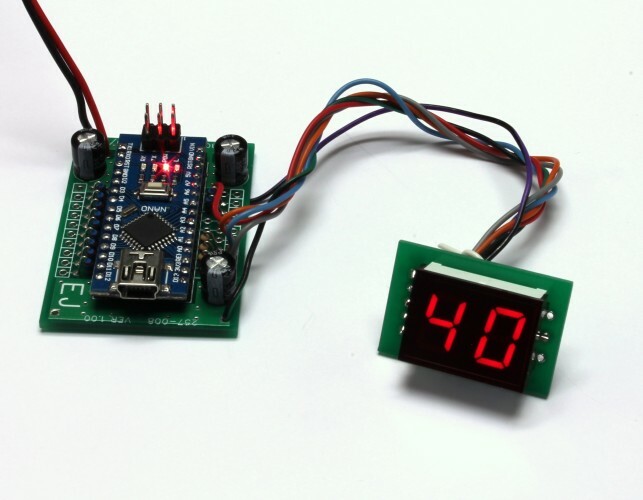 This takes the 25MHz input and generates two outputs, programmable to an accuracy of less than 1Hz. It's programmed serially from the controller board. Programming a new output frequency takes about 9 mS (just under a hundredth of a second). Only two outputs are used, going towards the right. These two sections are identical except for the bandpass filter capacitor values. From the output of the chip the signals pass through a 0 ohm resistor which can me changed later to limit the gain / prevent clipping distortion. It then goes through a series tuned circuit to the 50 ohm buffer IC, and then through another identical series tuned circuit. 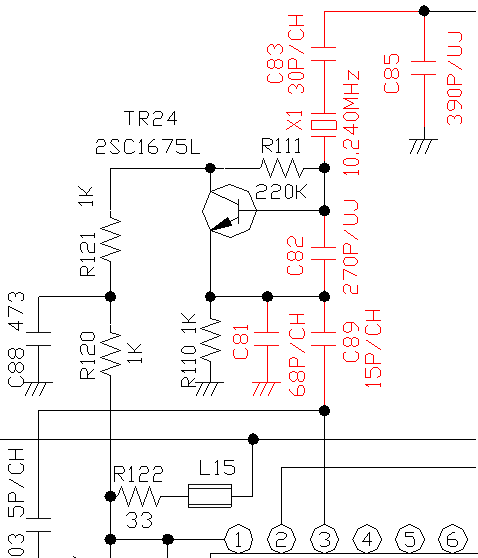 This gives a clean output of about 6 volts p-p with a bandwidth of 3 to 4 MHz. 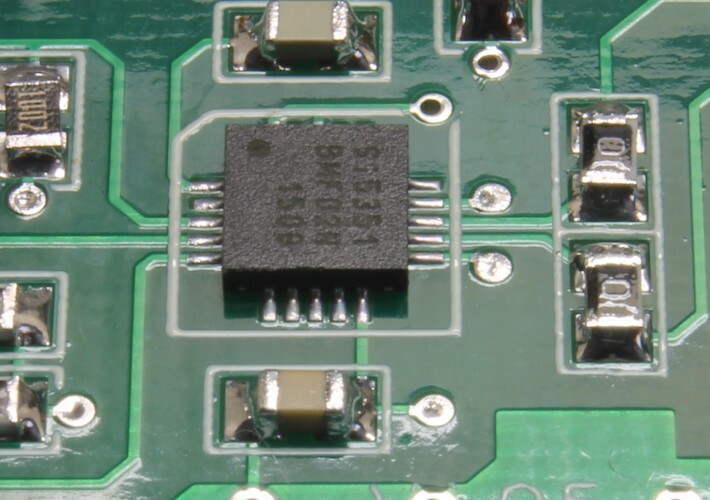 The buffer ICs are biased from the control board 9 volt supply via the larger 150 ohm 1 watt resistors. The top - right output is the carrier oscillator at 10.695 MHz, plus / minus the SSB offsets. The bottom right output is the local oscillator or downmix signal, depending on how the board is wired in. We wanted to try both methods, so caps for a 16-20MHz bandpass were fitted, and two thru hole caps temporarily tacked on for the downmix (14.010 MHz) version. Other exports use multiple crystals but our superstar used only one. This doesn't affect the design as it's a simple software command to change the frequencies generated. There are two ways do do the clarifier. The first method is to use the analog (VCXO) input but I'd rather keep that for FM audio input, so method 2 was used first. 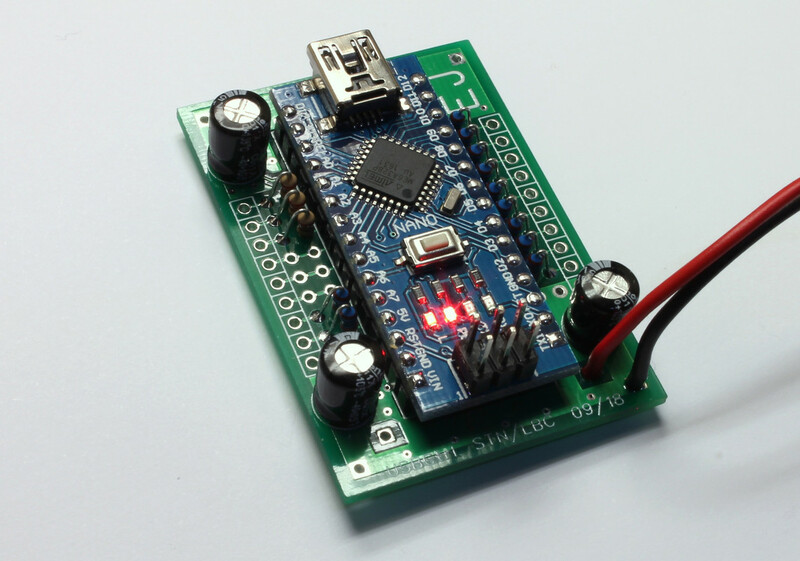 The second method is to use one of the ADC ports on the control board. If this was fast enough to be smooth in action, I'd user that as it simplifies FM input and it gives more precise and flexible control. Turns out it was, so we stuck with #2. The ADC is 10 bit, so that's 1024 steps, or slightly better than 0.1% accuracy. Being now software controlled, we added a "dead zone" 3 degrees either side of "12 0 clock" so that the user only had to place the control near the centre to be centered, not dead on it. The range was set in 4 Hz steps, giving a total range of 4096 Hz, in other words 2 Khz down and 2 KHz up. This can be changes to anything the owner wants by altering one line of code. It's also easy to have it receive only, unlocked for transmit and receive, turned off entirely, or have multiple ranges by just coding the analog input to suit. Spectral purity plenty good enough for a local oscillator. Some low level spurs 2 MHz away @ -60dB. It was then fitted to the radio. 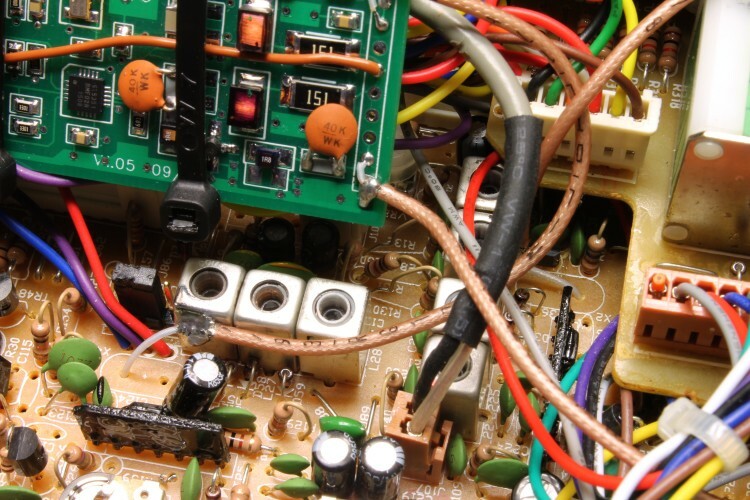 The 150pF and 270pF (10.695) / 68 and 120pF (14.010) phase shift capacitors were removed from the radio to turn the oscillators into buffers, and the outputs of the synth board were fed to the respective crystal holes on the "hot" side of the crystals. Control board fitted to radio. It's only temporary, so just gently tied down with zip ties for the stability tests. The finished result was promising. Drift was -4Hz @ -10 degrees C, + 1 Hz @ +20 degrees C, and +7Hz @ 60 degrees C.
Most of this came from the 10.240 oscillator, so next thing to do will be try replacing the VCO with the LO output, i.e. 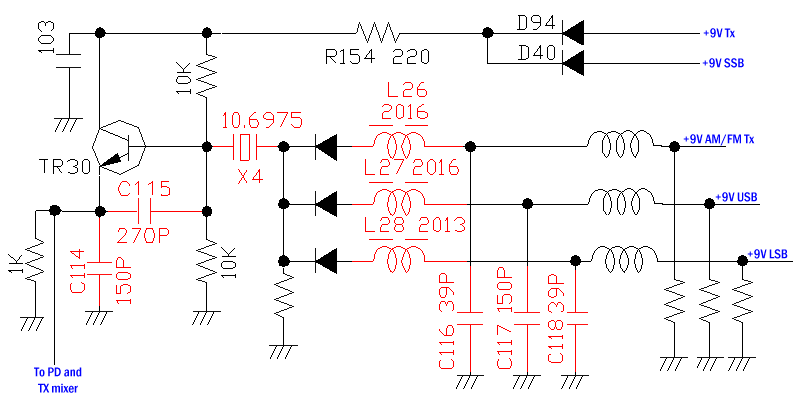 replacing the original PLL circuit entirely. But first, the radio will be returned to its owner to try out for a week or three. Last edited by lbcomms on 12 Oct 2018, 05:31, edited 1 time in total. Thanks for sharing, always enjoy reading about experiments and mods. Looks like youve been busy. Those little Arduino boards are awesome for experimenting, Sadly I dont know the first thing about writing code for them. Anyway nice fix, thanks again for posting and sharing. Kudos to you, that is a great mod! How will you roll this mod out as a kit or in shop only mod? Have a Galaxy DX95T2 myself so am keeping a watchful gaze upon this thread thats for sure. It is very much a prototype at this stage, we will be doing at least half a dozen different radios and noting / correcting any issues before possibly making a kit for sale later on. 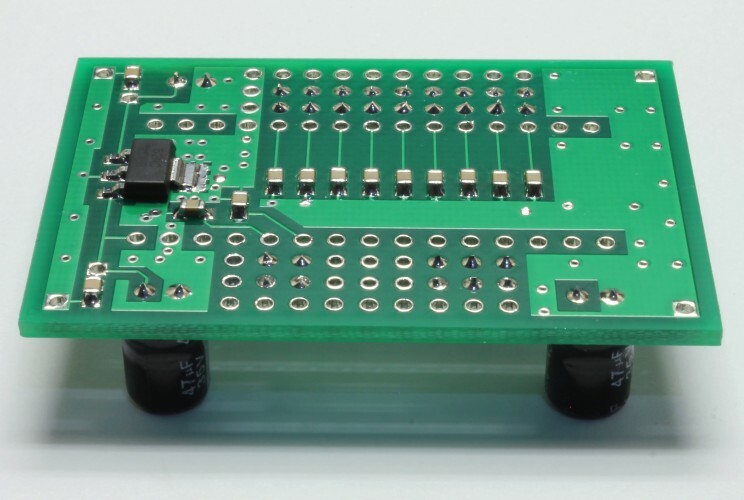 The synth board as above was also designed to make it changeable with links and tacked on through hole components in case any issues showed up. 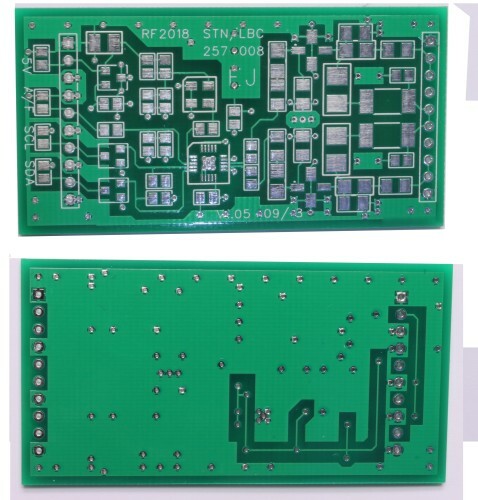 The final board will be about half the size and use a more conventional RF PCB style. The owner of that radio in this thread is currently testing it on a big desert road trip, I'm waiting for him to get back here to see how it went and to experiment with a different way of connecting it to the radio (replacing the VCO with the LO output directly to eliminate the slight drift from the 10.240 oscillator). Any idea as to time frame? Another question which I forgot to ask earlier, what is the spectral purity like out of the finals in the unit you fitted it too? how far down are the harmonics and crud that gets generated and is it an improvement over the original. I know that all depends on what sort of job the factory (or a bodger ) did on the tune up but I am presuming that your add in osc's dont significantly contribute to unwanted output. As far as time frame goes, it'll be at least a few months, possibly longer, it depends on workload and time. Not going to rush anything out and have it bite back later on. We also want to try at least 2 or 3 radios in it's other intended application - replacing the crystal synth section in 70's era 23 channel AM/SSB radios. Spectral purity on the first prototype as shown in the pics is good. The D/M output - if it had any spurs - would be removed by the PLL loop filter, which has a cutoff of a few KHz. Some spurs @ 2MHz were present at low level (-60dB below the main output) but were not visible at the output of the transmitter. There were also some at the CIO output but these were eliminated by the main crystal filter in the radio. That filter has a bandwidth on about 5 KHz, so a signal 2MHz away has no chance of getting through. We expect it to be slightly worse in the second version (same as in the pics above, but replacing the VCO with the LO output directly to eliminate the slight drift from the 10.240 oscillator). It' should still be negligible compared to the stock radio that only had IMD at -24dB before the mod and tuning. It's currently at -39dB, i.e. about 20 times better than stock. Certainly a much improved IMD, dont know whether to blame factory or other tunes for some of the poor results that sometimes get quoted for these radio's though properly tuned they are very good. I no longer have 2 sig gens available to do accurate IMD checks unfortunately so it is interesting to see your comments on this. It all sounds like its on the up and up for the failings that Galaxy range had, cant wait to see your progress. Most of the IMD improvement came from tuning, not the modification. The SSB audio drive and ALC were a bit on the high side and the biasing was half what the optimum was. Looked great on a average reading power meter but not so good on the CRO and analyser. We backed off the audio drive and ALC to give a nice clean (two tone waveform on scope) 15 watts PEP, and increased the bias while looking at both IMD at 15W TT output and the quiescent (no audio on SSB TX) current draw to find the happy compromise. Settled on quiescent up by about 80mA but IMD 15dB better.